This year, the FCSLA realized a goal of sponsoring two buses. A generous donation was made by the First Catholic Slovak Union. 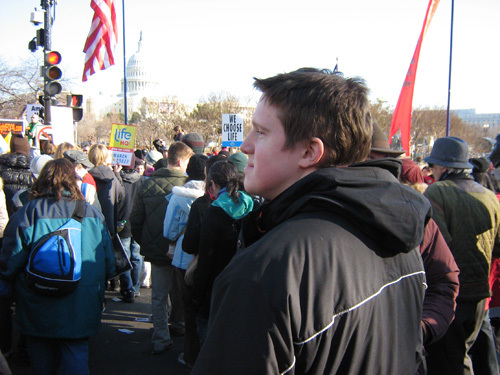 On the evening of January 21, 2009, FCSLA members gathered along with 77 members of the Benedictine, Regina, Baldwin-Wallace and the University of Akron Pro-Life Clubs. The buses started on their journey at 11:30 p.m. The travelers on both buses recited the rosary asking for God's protection and a safe trip. 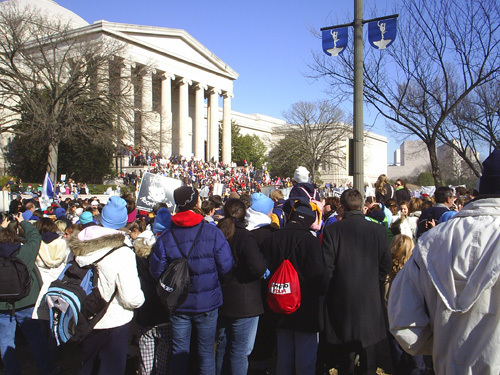 Our pilgrims arrived in D.C. at 7:00 a.m. with hopes of attending the Rally for Life and Youth Mass at the Verizon Center. 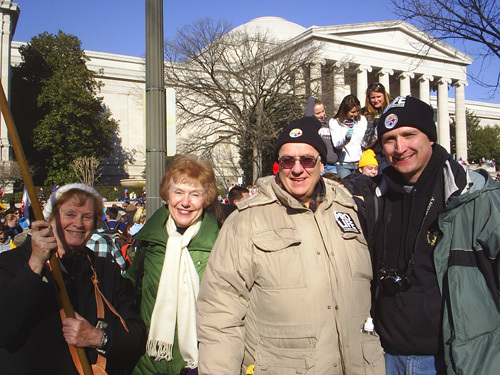 For the first time since the FCSLA has been sponsoring this bus trip, they found the Verizon Center filled to its capacity of 16,000 for a Mass that didn't begin until 10:00 a.m.
Our Slovak Flag, flying in a crowd of 250,000 people on Constitution Avenue, united all the members of the Slovak Catholic Fraternal Organizations. 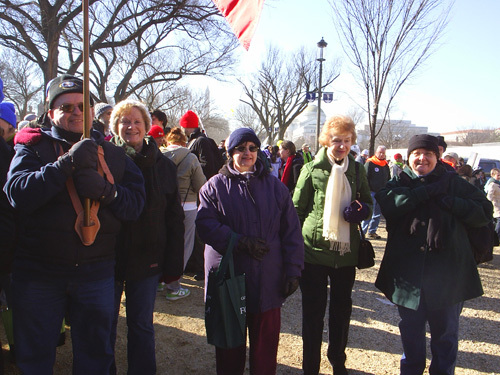 The March for Life began its journey up Constitution Avenue to the U.S. Capitol. The crowd seemed to be the biggest gathering for the march since it began. At the conclusion, everyone gathered back at Union Station. A pleasant and nourishing addition to the conclusion of the march was the wonderful lunch supplied by the Cleveland District for all the travelers. The dedicated, but tired, pilgrims arrived back at the Home Office at 1:00 a.m. Many of the students commented that without the kindness and generosity of the FCSLA, they would not have had the opportunity to attend the march, and stated how incredibly grateful they were for this experience. 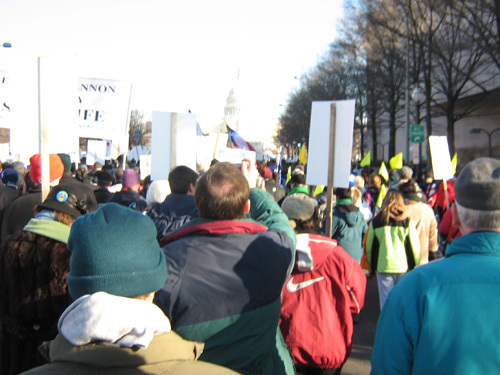 I will share the date of the 2010 March for Life as soon as it is published. This will give you the opportunity to mark your calendar and make plans to join us, and perhaps fill three buses.